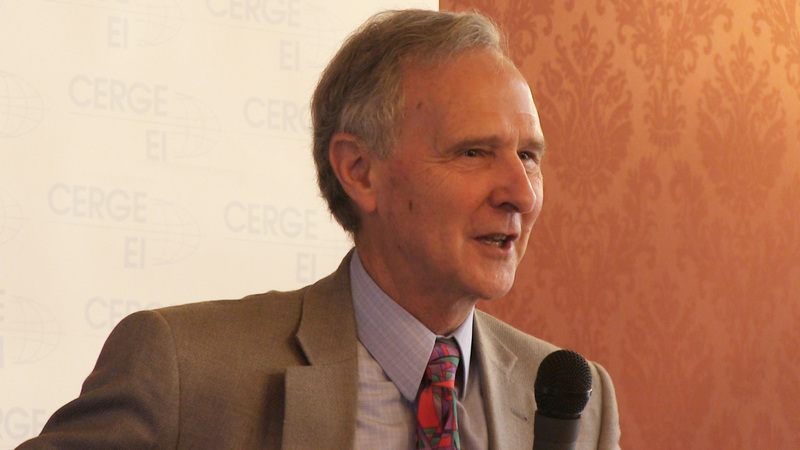 “Economic growth is a function of education, period.” During his public lecture at CERGE-EI, Professor Eric Hanushek emphasized the enormous impact that human capital (i.e. education) has on long-term economic development. A renowned scholar in educational research, Professor Hanushek (Stanford University) used this link between education and development to make a compelling argument for improving the quality of instructors. 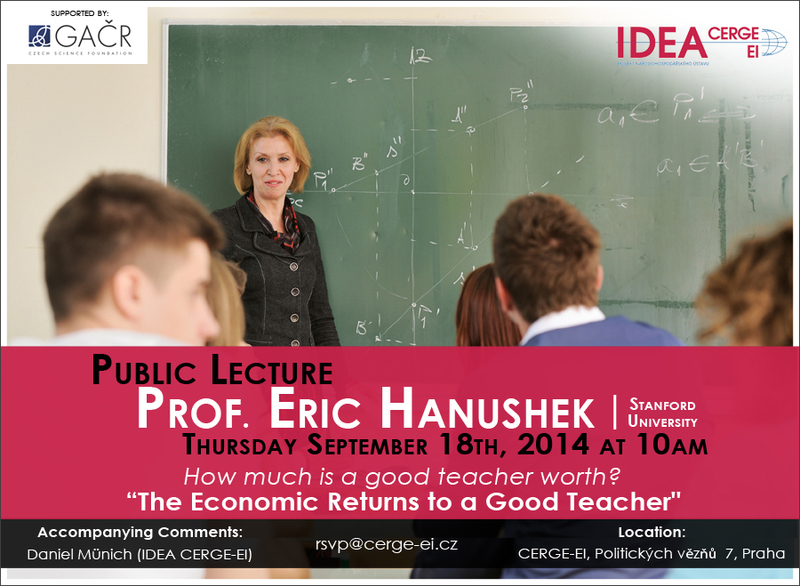 Prof. Hanushek began his lecture from a distance and gradually brought the audience ‘closer to earth.’ From the furthest vantage point, he established the unambiguous link between economic growth and test scores (i.e. what students know). 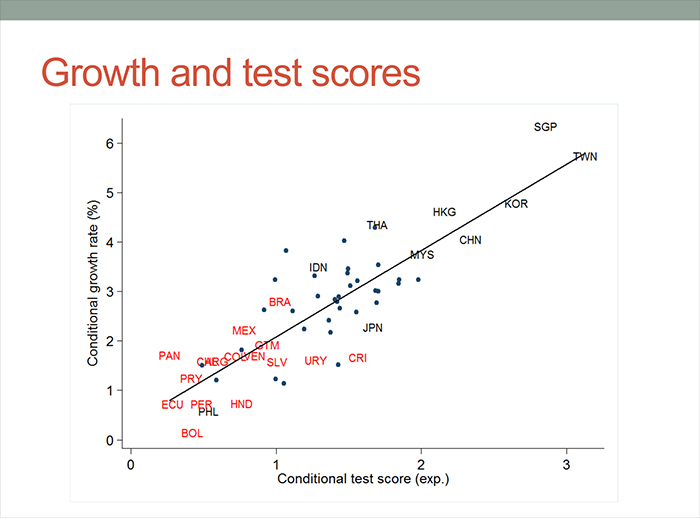 A graph plotting test scores and economic growth revealed a nearly perfect correlation for a wide sample of countries over the past five decades. To Prof. Hanushek, the data screams loud and clear that imparting knowledge and skills through the educational system is the most potent means by which countries successfully grow. Unfortunately, raising test scores is not so simple. Students may be required to attend school, and governments spend a great deal to make this happen, but merely sitting in a classroom with a teacher is not enough to guarantee meaningful learning. The question, then, is how to ensure that students learn while they sit in those classrooms. According to Prof. Hanushek, research on student achievement has identified that good teachers play the essential role. In economic terms, how much can a good teacher contribute to economic growth? He showed that a top teacher with a class of 30 students will boost the cumulative lifetime income of that classroom group by over $800,000. Of course the inverse of this relationship also exists: lousy instruction from the worst teachers will damage their students’ earnings by a similar magnitude. Removing the worst teachers and replacing them with average ones could contribute to large gains in test scores—and as Hanushek already demonstrated, higher test scores should directly contribute to long-term economic growth. Analyzing the Czech Republic and making conservative assumptions about teacher quality, he showed that removing the bottom 5% of teachers and replacing them with average instructors could lift the country’s test scores to the level of Finland. This in turn would add 110 trillion euros to the Czech Republic’s GDP over the next 80 years (in present value worth). Considering the enormous impact that good teachers can have on student achievement and economic growth, the focus on improving teacher quality should be paramount. Unfortunately, solutions to improve teacher quality are often misguided and ineffective. Rather than focus on a teacher’s educational credentials, experience, or training, Prof. Hanushek proposed solutions that work with incentives and focus on outcomes. He suggested methodically measuring testing outcomes and rewarding teachers for achieving defined objectives. He was also dismissive of those who see technology as a silver bullet. Accountability and performance rewards can be far more effective than giving students iPads. 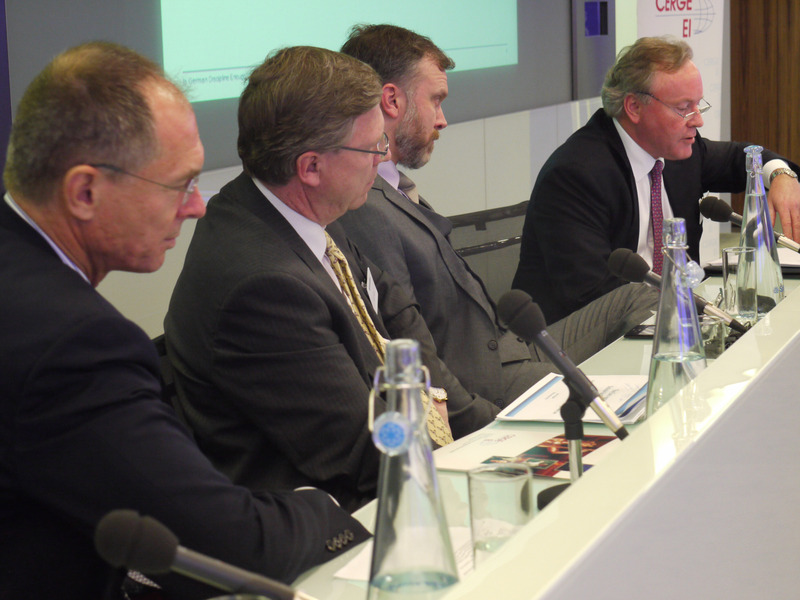 CERGE-EI Panel Discussion & Alumni Reunion in London! We did it! After several months of careful planning, numerous meetings and Skype calls between London and Prague, we finally did it. 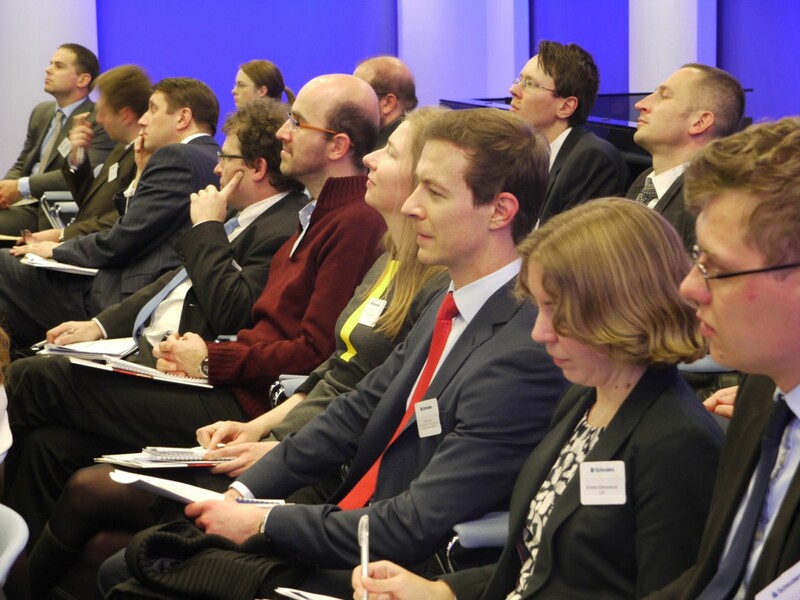 On November 28th, we kicked off CERGE-EI’s first ever UK Alumni Event! 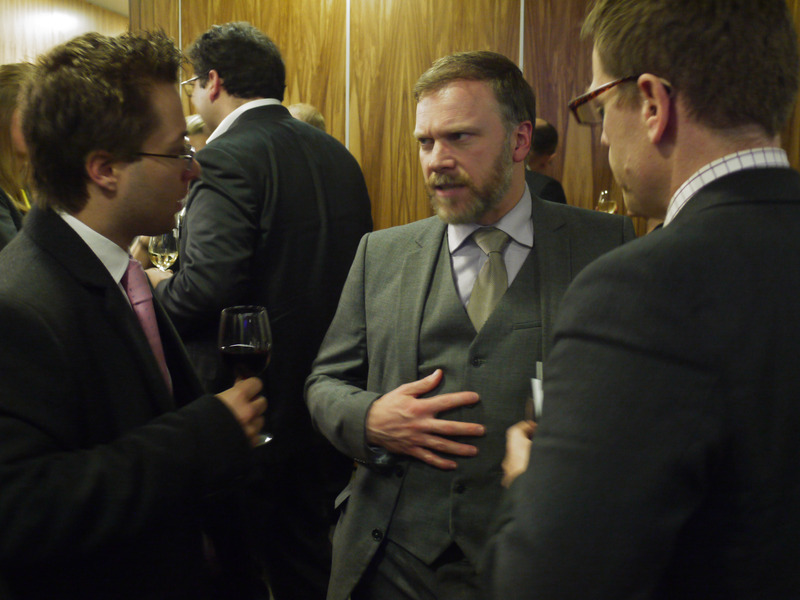 But make no mistake, this was no ordinary alumni gathering. We wanted an event that would play to the main strength of so many talented CERGE-EI economists: spirited intellectual discussion. With that in mind, we organized a special Panel Discussion and invited experts and special guests to join the debate. Thanks to Alan Brown (Board member of the CERGE-EI US Foundation) and his enthusiastic support to host the event at Schroders, we could meet in the heart of London, a few steps from St. Pauls Cathedral. Susan Walton, also a Foundation Board member, worked tirelessly to make it all happen. And of course, we all wanted to see each other. Many of us have not seen each other for years and some of us have never met before. Our senior alumni Anita Taçi thus held opening remarks to welcome all the guests in the name of the Alumni Community. And what have we discussed? The title of the debate was “Is German Discipline Enough?” The Euro is off the front pages – for now. The balance of payments crisis in the periphery is easing, the sense of crisis has abated, and the Eurozone has bought some time. However, we know that the true crisis is not yet over. Before the next shock strikes, what are the prospects that the Eurozone will use the time to establish a Banking Union, and to move towards a proper fiscal Transfer Union? All these issues are truly important for the future of Europe and stability of the old continent. 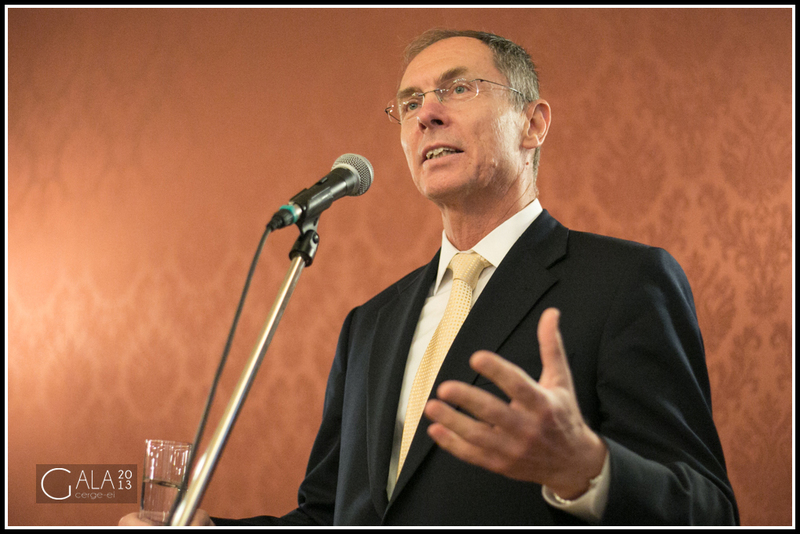 Therefore, our second opening remark was held by Czech Ambassador to the UK, His Excellency, Michael Žantovský, who recalled the ideas of the Czech president, Václav Havel, and related the topic to the problem of leadership and the ideas a leader represents. With so many esteemed speakers, the panel discussion proved highly provocative. Alan Brown moderated the discussion and introduced all four speakers, who provided different views on the same problem. The first speaker was Petr Zemčík, Director of Economic Research at Moody’s Analytics in London but whom many of us remember from his time as a professor at CERGE-EI. He discussed the role of Germany and suggested that rebalancing the export imparity between Germany and the periphery would not solve the Eurozone’s biggest problems. The missing transmission mechanism and incomplete banking integration means that deposits in different states of the Eurozone have different values, and so the entire system remains fragile. The second speaker was Prof. Jan Švejnar, one of the founders of CERGE-EI and currently the Director of the Center on Global Economic Governance at Columbia University. Prof. Švejnar provided a parallel between the US and the Eurozone. He stressed that recent incomplete integration in the Eurozone is certainly an unstable equilibrium and either deeper integration is needed or the Eurozone must go the opposite direction. Then, John Nugée took the podium. He opened his speech by pointing out that the Eurozone monetary policy is causing a positive feedback for all its countries. The widely discussed internal devaluation of the periphery is not a solution for the Eurozone. He concluded with a logical chain of unions which Europe has to undertake, starting with the currency union and leading through the monetary, banking and fiscal union, on an inexorable march towards full political union. According to Nugée, full political union is the inevitable endpoint on the Eurozone’s path to a stable solution. Andrew Lilico, Director and Principal of Europe Economics, discussed the lack of ideas behind current European integration. He stressed that two generations ago, the leaders were breaking down walls and restoring democracy throughout Europe. One generation ago, the leaders were unifying Europe and creating the big ideas of the European Union, and, consequently, the Eurozone. The current generation, by contrast, has no more big ideas left and is mired in small problems and technocratic issues. In the end he also cited full political union as the only viable solution. All agreed that the first UK Alumni Event was a huge success and has set the bar high for future Alumni gatherings, whether in the UK, in Prague, or in the many other places where CERGE-EI alumni are working to change the world. See you there next time! World Bank Present World Development Report 2014 at CERGE-EI: Watch the Full Presentation! Last month, the World Bank visited CERGE-EI to give a special presentation and discussion about their World Development Report 2014. Titled Risk and Opportunity: Managing Risk for Development, the WDR 2014 examines how improving risk management can lead to large gains in development and poverty reduction. CERGE-EI recorded the entire presentation, including the presentation slides. You can watch the whole event on the CERGE-EI blog here, or on the presentation website Slideslive.com. On any given day, CERGE-EI is filled with serious people conducting economic research and studying for exams. When it comes to complicated calculus and datasets, CERGE-EI is among the best. But when it comes to throwing a good party, we have a bit less experience. Nevertheless, the Graduation Gala proved that CERGE-EI knows how to do that too! On the evening of June 1st, our beautiful palace rooms, usually the location of lectures and exams, were filled with fun and celebration previously unknown here! All who attended will agree: the 1st Annual Graduation Gala at CERGE-EI was an unbridled success. We welcomed over 160 guests—students, alumni, faculty and staff, the members of our governing bodies, as well as our donors and other business guests. It was an amazing evening filled with speeches, live music, gourmet food, and dancing. The Gala started with a champagne reception accompanied by a live jazz quartet. Dressed in their best suits and dresses, most guests were eager to have their ‘celebrity photo’ on the red carpet at the top of CERGE-EI’s regal marble stairwell. An audience gathered to hear welcome speeches by Susan Walton (CERGE-EI Foundation Board member) and Jan Švejnar (a ‘Founding Father’ of CERGE-EI and Chairman of the ESC). 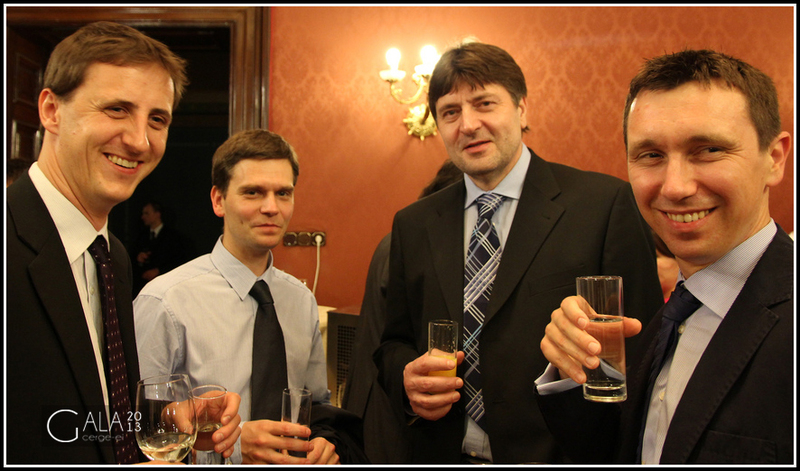 Before dinner, guests also heard remarks by CERGE-EI alum Martin Kálovec and recent PhD graduate Peter Ondko. 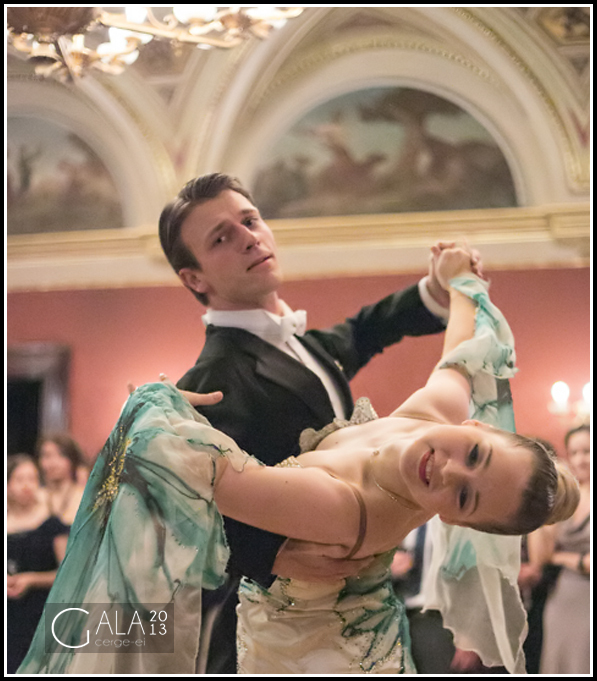 After an elegant dinner, the Gala continued with remarks by J. Peter Neary (Professor of Economics at University of Oxford and a newly-elected ESC member at CERGE-EI), a touching speech by Dragana Stanišić (CERGE-EI Junior Researcher), and a ballroom dance performance by a professional dance pair. A ‘Surprise Student Raffle’ followed, awarding fun prizes to CERGE-EI students, including boat rides and tennis matches with CERGE-EI faculty members. The Graduation Gala establishes a new tradition at CERGE-EI. 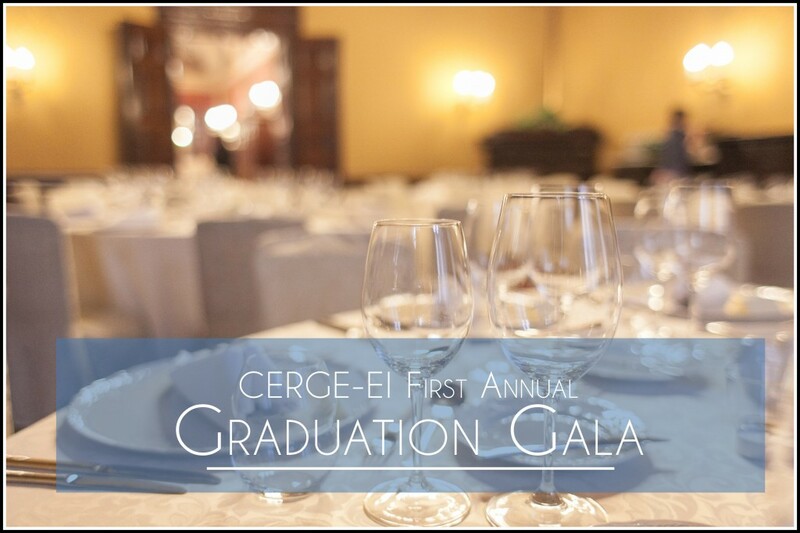 Once a year, the students, faculty, staff, alumni and affiliates who make CERGE-EI such a successful place deserve a night like this. With each passing year, our Graduation Galas will offer the best opportunity for the CERGE-EI community to reunite and celebrate. Looking forward to next year! See more pictures from the First Annual Graduation Gala here!